We Were Too Naked at Go Naked 2013. Well here we are; the 2013 competition season is upon us and we will once again start another quest for a Grand Champion trophy. 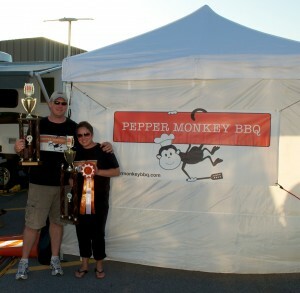 We had many top ten and even top five finishes in 2012, and managed to place 9th overall in the Mid Atlantic Barbecue Association for the season, but we have yet to break through for 1st place overall in a KCBS competition. We kept with our annual tradition of making the 1st competition of the year the Go Naked BBQ Show in the parking lot of Mason Dixon BBQ Services. 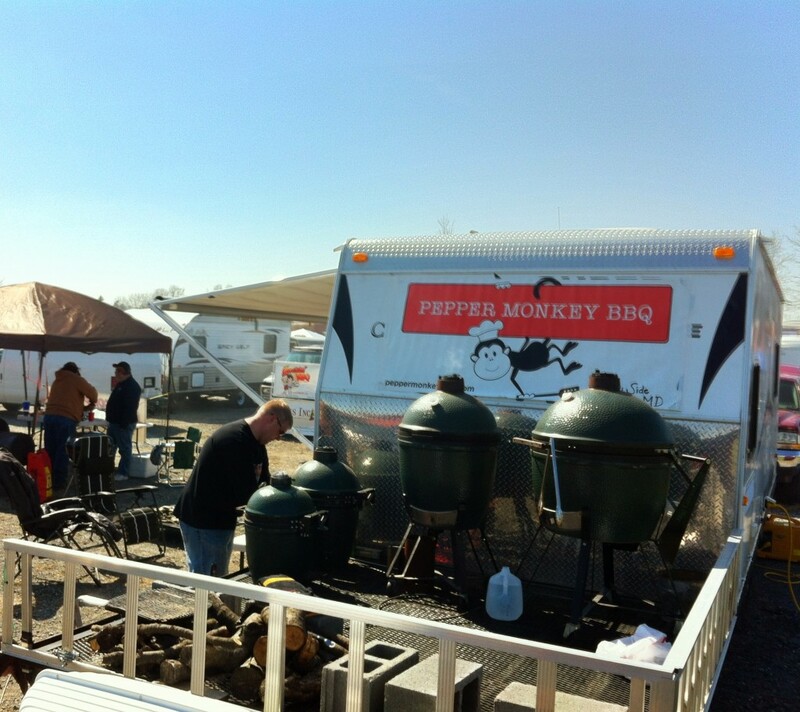 We loaded up the, ‘BBQ House’ and headed to Green Castle, PA in hopes of starting the year with a bang! Our first bang came less than a mile from our trailer storage area when oncoming traffic hit a deer which then bounced off our trailer and off to the side of the road. Somehow we got very lucky, and besides having to remove a little venison tartar off the bottom frame, we came out of it unscathed. I’m not sure how well Big Green Eggs can handle a direct deer strike, but had it been two feet higher we may have found out. Our setup at Go Naked 2013. GoNaked is organized and hosted by Eric Forrester which means it’s always a fun competition and things are almost guaranteed to run smoothly. Despite a little breeze on Friday (something like 35 mph gusts) the weather was nice and sunny. By Saturday it was calmer and nearly perfect for BBQ … Sauceless BBQ that is. No, we didn’t forget anything on our packing list, NO SAUCE was the rule this year. Only chicken and ribs are cooked with no electronic assistance at Go Naked. The added twist for 2013 was that it was, “Even more naked” meaning no sauce was allowed for either category. This is not a normal rule for a competition; actually this is the first time we’ve even been in a ‘no sauce’ situation. Personally we like good dry rubbed BBQ … In our house, sauce is served on the side and rarely used, but competitions are different. Teams were asked to ‘stay within the spirit of the competition’ when people started inquiring as to what ‘sauce’ really is. We may have taken the spirit a little more to heart than we should have because we literally turned in dry rubbed ribs and chicken and learned that most teams still had ‘glaze’ on their meat, which based on what we were able to taste, not only blew our flavor out of the water, but also catered to what most judges have grown to expect. Our food was a little spicy because we used mostly the same flavors we use on a sauced piece of meat, but the sweetness was lacking and we did little to make up for it. So needless to say we did not get a call; as matter of fact the only time we heard our name all weekend was when Sal kept asking where PepperMonkey’s beer cooler was! We finished middle of the pack which for this competition is just fine with us. But without question, we are hoping for a strong start to the season in our first ‘official’ competition in Annapolis the first weekend of May. 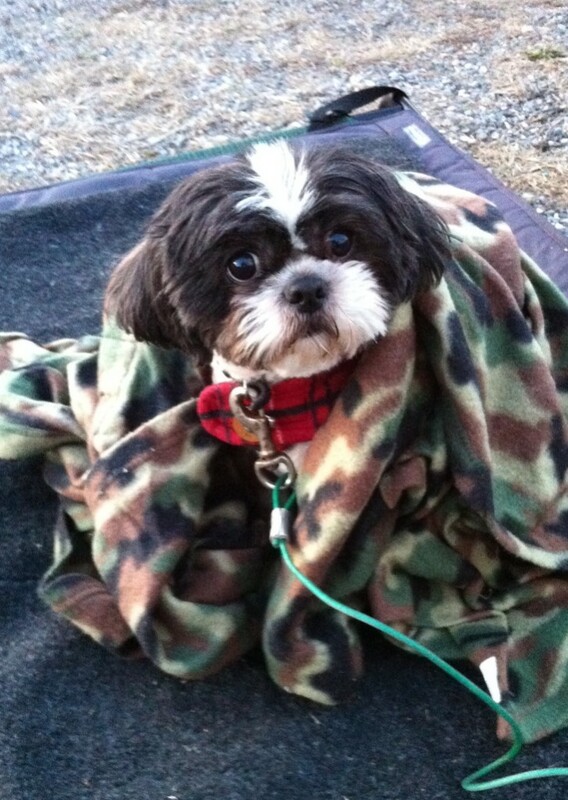 Cosmo’s perplexed look when he realized we were turning in boxes with no sauce. Congrats to those who did get a call, especially to Dan and the Drillin’ and Grillin’ crew for their Grand Champion victory. Special thanks to Eric for having faith in us to design and make all the custom awards for this years event. We tried to ensure that Dan knew his giant cutting board had a food safe finish on it so it was completely functional, but he made it clear that he would not be using it to cut anything on! Great job guys! 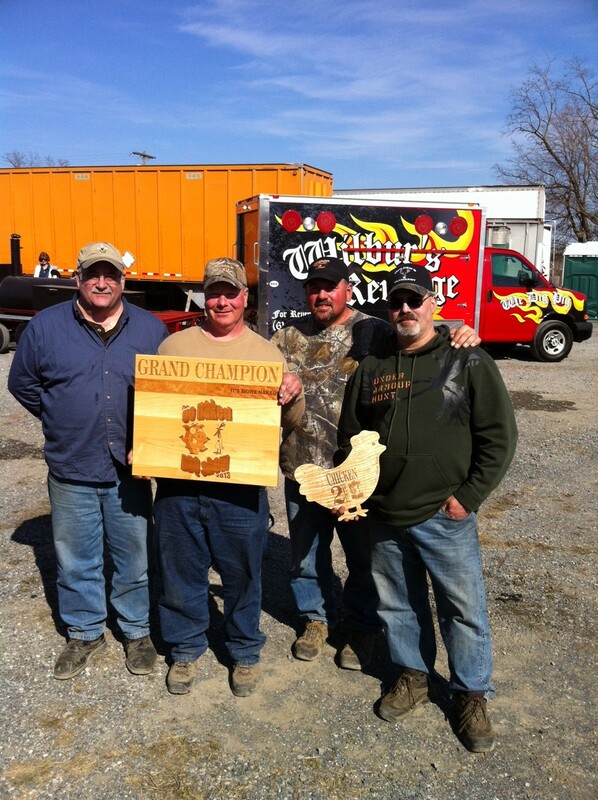 Dan and the Drillin’ and Grillin’ crew showing off their first ever GC trophy! Hey Scott … Not sure how many un-sauced entries you’ll be seeing … but if it’s another no sauce competition, we will likely opt to have a seat next to you in the judges tent!!! Make sure you stop by and see us in VA.
Well Kit, Bum never did manage to kick my Steelers door down! Thanks Kit. Glad the pig plaque has a good, well deserved home! On that note, don’t hesitate to email us if you have any ideas or thoughts on trophies/awards. Either anything you’ve seen or something you just think would be cool. We’ve been contacted about doing awards for a couple more events and want to keep them unique (and wood of course). Looking forward to a full comp! Not much change on our part for the first few comps at least. An updated flavor profile with nearly identical cooking techniques … except this year we have one more green egg so no more cramming all the big meats into one cooker … should simplify our cook even more. Good to see you again, see you in a few weeks! Oh by the way, we couldn’t help but notice on Sunday morning that you had forgotten your trailer in greencastle … just FYI ! That was the first question I had about no sauce when you mentioned it. Mops? Glazes? Indeed they came up with a definition that a ‘sauce’ was anything applied during the last 15 minutes of cooking to finish the meat, otherwise it was considered basting or mopping and was legal. So basically I think a lot of people ‘basted’ right up to the last 15 minutes then left it alone … perfectly legal, so no worries! Had it been ‘Dry rub bbq’ no questions asked, maybe we would have scored a little better!